I’ve enjoyed Jacques Tourneur’s SHOCKtober-worthy Cat People and I Walked With a Zombie, so I planned on watching Night of the Demon and The Leopard Man this year. But wait – just discovered that his father Maurice was also a filmmaker, also made horror movies, and their careers overlapped. So I watched movies by father and son from 1943, along with an early silent short. High-quality studio picture that plays like an expensive Twilight Zone episode until it gets bonkers towards the end. Very nice light and shadows, some Cocteauian fast-motion and reverse photography providing subtly supernatural effects. Failed painter Roland (Pierre Fresnay of Le Corbeau and Grand Illusion) buys the titular hand from a great chef (who immediately loses his own right hand and his kitchen skills – this doesn’t seem to faze Roland) despite warnings from the chef’s assistant Ange (heh) and then sees his painterly fortunes soar. But he begins to be stalked by a short, cheerful man in a bowler hat claiming to be the devil and taunting Roland – offering to take back the hand in exchange for tons of cash. His girl Irene (Josseline Gael of Raymond Bernard’s Les Miserables, whose career ended the following year, imprisoned for sleeping with the Gestapo) was the impetus for Roland’s devil-hand purchase, dumping him at dinner in front of the chef, calling his artworks trash. After his success, they’re married and the devil tries to trade her soul for Roland’s, calling her “a beautiful sinner.” Later she phones Roland from the hotel where she used to live offering him enough money to unload the hand, but when he arrives she has been murdered. I’m missing something – why her old hotel? How’d she get the money? By doing something immoral, no doubt, but she made more money in two days than the most celebrated painter in town could dig up? Anyway, after losing everything at a casino, Roland stumbles into the best part of the movie, a dining hall full of ghosts of the men who formerly possessed the hand, telling their stories via shadow-plays, culminating in the appearance of Maximus Leo, whose hand they’ve all been fooling with. So Roland goes off to the mountains trying to locate Leo’s grave so he can return the hand and break the curse. 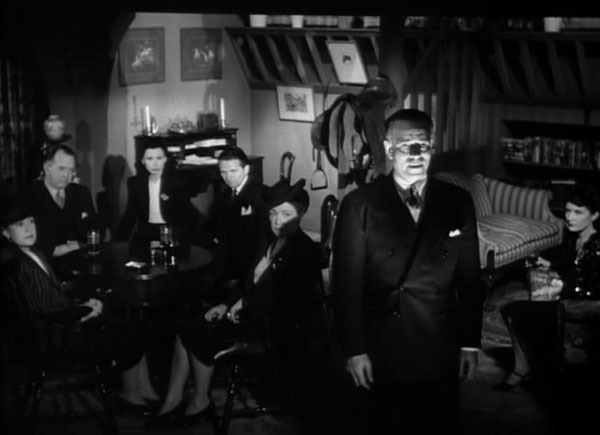 Framing device: he’s been narrating all this to the patrons of a snowed-in lodge (who provide most of the film’s sense of humor), despondent because the devil just staged a power outage and nabbed the hand. The devil seems alternately powerful and feeble, serious and pranksterish in this movie. Suddenly Roland runs outside, chases down the devil and wrestles free the hand before falling to his death – upon Leo’s grave. So the curse is broken, I guess. Anyway, the movie is very enjoyable despite my story confusions. Based on an 1832 short story, no relation to The Hands of Orlac or The Monkey’s Paw. 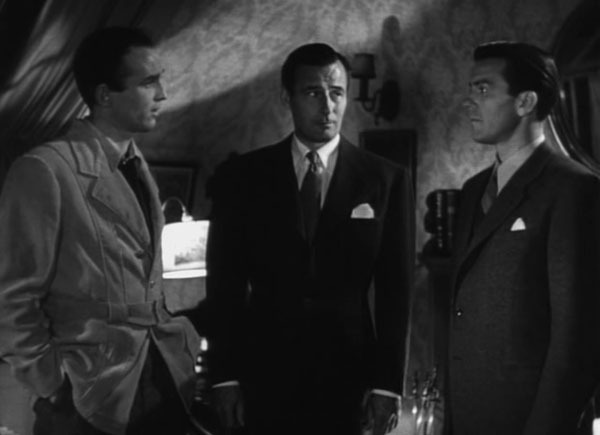 Even if some sequences make use of expressionistic lighting, Tourneur manages to instill a sense of fear by emphasising the concrete consequences of the Faustian pact rather than the supernatural powers of the Devil … Above all, the pact functions as a commercial transaction … As with other films made during World War II, there are no direct references to the military and political context of the time. But Roland’s wild-eyed looks upon entering the inn at the outset of the film express a feeling of pervading paranoia that one can fully comprehend only by taking into account the extra-diegetic reality. The horror elements of Tourneur’s La Main du diable may well express an anxiety experienced by every Frenchman opposed to the German invasion, in their souls if not through action. 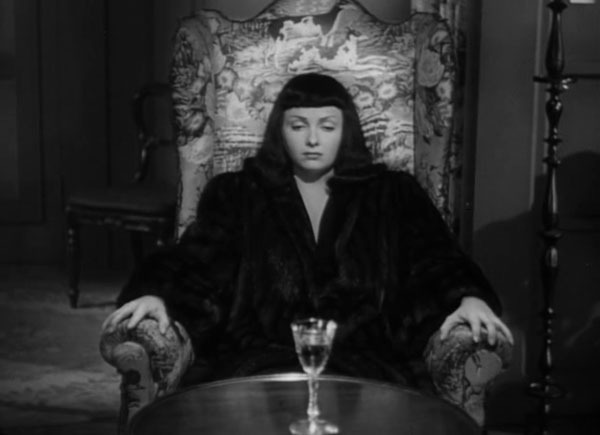 Another in the Val Lewton series that also produced I Walked With a Zombie, The Seventh Victim and The Ghost Ship – all in the same year! This one seemed more slight than the others I’ve seen (Curse of the Cat People excepted). A leopard gets loose in New Mexico after a publicity stunt goes wrong, kills a bunch of young women, and the singer and publicity man responsible for its escape try to help out (though they’re low-key about it, because it’s not cool to act responsible for terrorizing a town). Kiki (serial player Jean Brooks, with a nice Myrna Loy-like voice) is the singer and Manning (Dennis O’Keefe, in Hangmen Also Die the same year, also star of the original Brewster’s Millions and Anthony Mann’s Raw Deal and T-Men) the publicity man – and the guy who lent them his leopard is named Charlie How-Come, a good-natured guy, but he’d like his leopard back, please, or the $225 it’ll cost to get a new one. I don’t remember if Charlie ever gets paid. Young Teresa is the first and saddest victim, having to cross town at night to buy cornmeal, then pounding at her door to be let in as the leopard approached. Next up is Consuelo (a Finnish actress playing Mexican – hey, any foreigner will do), accidentally locked into a cemetery while awaiting her boyfriend. And finally Clo-Clo the maraca girl (“Margo” of Lost Horizon – too bad they couldn’t get The Panther Woman from Island of Lost Souls) who kinda had it coming, since she purposely frightened the leopard at the beginning, leading to its escape. Turns out a local professor (James Bell, who also played the doctor in I Walked with a Zombie) found the dead leopard (or did he kill it?) and has used the leopard-on-the-loose headline as license to kill girls himself, leaving leopard-like evidence at the scenes. What a weirdo. I like how first he tries to convince Charlie How-Come (the “leopard man”) that Charlie is becoming a leopard while drunk, so that Charlie asks to be locked up, werewolf-style. A silent trifle with a good ending. The classic plot, which may not have been so classic at the time, of a man who bets he can spend the night in a spooky place (wax museum) in order to prove his bravery. But he’s not brave at all – the wind and shadows scare the hell out of him, and when his prankster friend sneaks in, he gets stabbed to death by his crazed buddy. Adding to the sense of strangeness is some wicked, Decasia-worthy film damage, coincidentally appearing right after the title “Deeper into the night, the wax figures become more terrifying.” If you saw your world melting and tearing apart like this, you’d go mad, too. I pick these movies up one at a time on cable and elsewhere so I don’t have access to the Val Lewton box set bonus material which would explain why it’s his name I always hear associated with this and Cat People instead of Robson and Tourneur. This one is more eventful than Cat People, has quite a large cast and a packed, twisty plot for a seventy minute film. 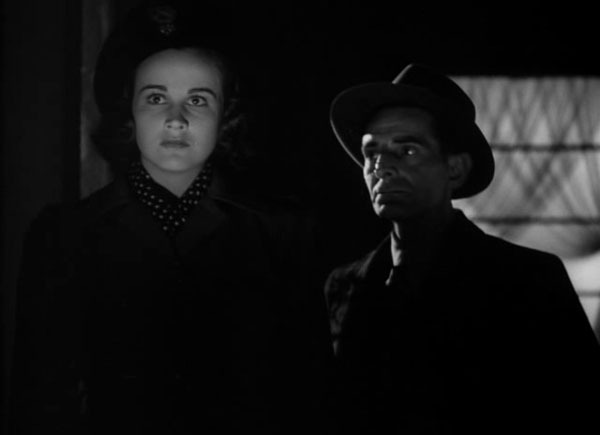 Mary (Kim Hunter of A Matter of Life and Death in her first film role) is told by her school that her sister Jacqueline quit paying her bills six months ago so she’ll have to go home. Mary heads for scary, shadowy Manhattan to locate her sister and gets caught up in all kinds of intrigue. Turns out the sister joined a satanic cult (the most gentle, mild satanic cult I’ve ever seen in a movie) and mentioned it to her psychologist Dr. Judd. Well, the first rule of the satanic cult is you do not talk about the satanic cult, so the members have been hiding her away trying to get her to kill herself. Sorta. She found time to get married (to a dude named Greg Ward) and she continues to see Dr. Judd at least once a week, and she’s spotted around town, so the seclusion thing doesn’t seem to be happening – plus the cult sends a man with a knife after her towards the end, kinda defeating the get-her-to-kill-herself angle. Mary falls sorta in love with her sister’s husband, and a poet who hangs out at the Italian restaurant under her apartment (called Dante) falls sorta in love with her, and I can’t tell whose side the doctor is on, exactly. A craggy-faced private investigator with no known motive tries to help Mary but gets killed by Jaq by accident. Jaq shows up then disappears then is easily located again. The cult members ask very politely and straightforwardly for her to drink poison, but she just won’t. Finally Dr. Judd and either the husband or the poet (it’s not important) tell off the cult by invoking the lord’s prayer (good luck with that) and Jaq has an intriguing chat with a sick, dying neighbor then goes and hangs herself.